The bankrupt assets of Hostess Brands, Inc., the company responsible for Twinkies, Ho Ho’s, Sno Balls and Ding Dongs, are being put back to work by a buyout firm. What’s not being put back to work are the former Hostess unionized employees. The unionized workers had been on strike when the company folded late last year. The company had imposed a contract that would cut its 19,000 workers’ wages — 15,000 of whom belonged to the workers from the Bakery, Confectionery, Tobacco Workers & Grain Millers International Union (BCTGM) — by 8 percent. (The Teamsters was Hostess’ largest union, followed by BCTGM.) The contract would have also cut benefits by 27 to 32 percent. 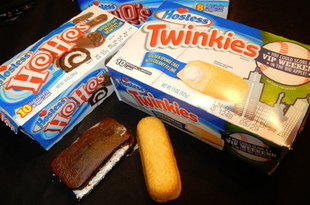 Hostess filed for Chapter 11 in January 2012. In November 2012, the company announced it would be shutting its doors for good. By that time, it had lost about $1.1 billion, largely due to bankruptcy filings. But last month Apollo Global Management, LLC, and Metropoulos & Co., which owns Pabst Blue Ribbon and Vlasic pickles, bought the 83-year-old company for $410 million, renaming it Hostess Brands LLC. It is planning to re-open four bakeries over the next two and a half months, in Columbus, Ga.; Emporia, Kan.; Schiller Park, Ill.; and Indianapolis. It is also contemplating a fifth in Los Angeles. According to a report in the Wall Street Journal, C. Dean Metropoulos, the company’s chief executive, said that between now and September, he plans to inject $60 million in capital investments into the plants, and hopes to hire at least 1,500 workers. But those workers won’t be unionized.